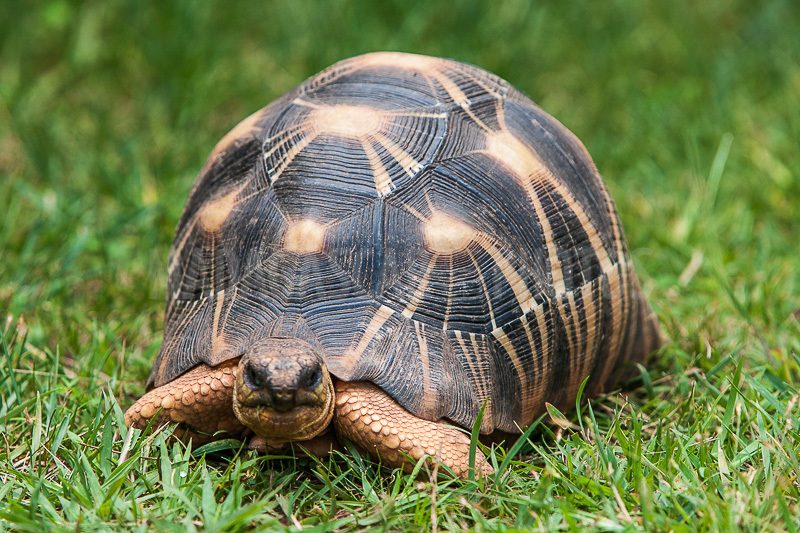 The Radiated tortoise or Radiata (Astrochelys radiata) or else Sokatra of its Malagasy name is endemic of the South of Madagascar where it is still than 1200 per square mile. It is nonetheless a threatened species because if the taboos or "fady" of the local populations prevent its consumption, it is highly prized by other ethnic groups for its flesh as well as poaching destined for the illicit export, among other things for the Asian market. It is considered one of the most beautiful tortoises in the world, characterized by a black carapace strongly rounded on which appear stars of gold growing with time and each streak corresponding to a year, which makes it possible to determine quite easily its age. Its life span is an average of a hundred years, but in 1777 Captain Cook offered a male specimen to the Tonga dynasty during one of its passages on the islands, she died on May 16, 1965 at about 190 years.